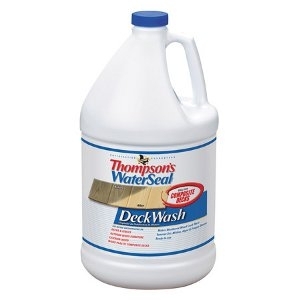 If your deck is old and weathered, all you need to get rid of that dirty gray look is Thompson's® WaterSeal® Deck Wash. It's easy—no scrubbing, no waiting. Just spray on, rinse off with a hose and in minutes you'll see the gray weathered look disappear. Prepares the surface for continued protection. Makes weathered wood look new. Removes stains from dirt, mildew, algae and fungus. Use before waterproofing on: decks & fences, outdoor furniture, exterior wood, wood plastic composite decking. Use if you need to remove stains from dirt, mildew, algae & fungus and there is little or no trace of a residual finish. Approximately 250 sq. ft. per gallon depending on the condition and the porosity of the wood.